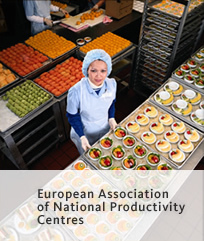 The European Association of National Productivity Centres was established in 1966 as a successor body to the European Productivity Agency. Its purpose is "to facilitate and increase exchanges of information and experiences, and arrange co-operation among participating bodies". Its seat is in Brussels. Membership in the Association was open to all ‘national productivity centres’ or institutions deemed their equivalent within the member states of the ‘United Nations Economic Commission for Europe’. From January 2003 the Association operated on the basis of ‘projects’, each entrusted to a member organisation, usually in cooperation with two other members. Of prime concern were the workshop meetings arranged in rotation by a host member. Each workshop meeting focused on a key area of the host's own programme to which others did contribute. Workshops followed in the EANPC tradition whose recent meetings centred on key topics of concern to enterprises and governments like labour productivity in service sector, productivity and structural change at the regional level, productivity and environmental improvement and ‘e-Learning’. The statutory bi-annual meetings of the Managing Board were held in conjunction with these workshops. A second project was the establishment of a European Productivity Network. EPN was open to institutions and individuals subscribing to the philosophy of the 2005 Memorandum on Productivity - The high road to wealth .Loan options to fund your small business from firstamericanmerchant.com The FirstAmerican Guys have helped thousands of merchants achieve their goals by providing a loan to help their business thrive. The Association maintained contact with international organisations concerned with productivity, in particular the ILO-the International Labour Organisation (Job Creation and Enterprise Development Department www.ilo.org/dyn/empent), APO-the Asian Productivity Organisation (www.apo-tokyo.org), and other productivity organisations world-wide.